Cooked. California roll topped with baked imitation crab. Tuna, crispy onion, topped with avocado, salmon with spicy mayo and sweet chili sauce. Romaine lettuce, tomatoes, cucumbers, red onions, black olives, tossed with a house salad dressing topped with feta cheese zaatar and olive oil. 3 eggs of your choice: omelet, scrambled or sunny side up. Served with israeli salad and choice of: cottage cheese, cream cheese, labneh, sour cream, feta cheese or mozzarella cheese (egg white available upon request). Choice of 3 vegetables: onions, tomatoes, mushrooms or parsley add $1.00. 3 sunny side up eggs served on roasted tomatoes, onions and peppers. 3 sunny side up eggs served on creamy spinach sauce. TWO SCRAMBLED EGGS SERVED WITH A SIDE OF FRENCH FRIES. Fresh sliced mozzarella cheese, fresh sliced tomatoes, fresh basil topped with pesto and balsamic vinaigrette. AVOCADO, RED ONION, CILANTRO WITH HOUSEMADE, SUN-DRIED TOMATO SAUCE SERVED WITH SWEET CHILI SAUCE. HUMMUS TOPPED WITH WARM TAHINI, CHICK PEAS AND A HARD-BOILED EGG. FETA CHEESE, ROMAINE LETTUCE, BLACK OLIVES, RED ONIONS, AND TOMATO WITH ZAATAR. Homemade sundried tomato sauce, spinach, black olives, sunny side-up egg and mozzarella cheese. Tomatoes, hard-boiled egg, garlic sauce, mozzarella cheese and feta cheese. Tuna salad, onions, tomatoes and mozzarella cheese. Roasted eggplant, homemade sundried tomato sauce, pesto black olives, hard-boiled egg, and mozzarella cheese. Tomatoes, black olives, red onions, feta cheese, zaatar and olive oil. Pesto, tomatoes, black/ green olives and mozzarella cheese. Black olives and mozzarella cheese pizza sauce. Pesto, roasted peppers, roasted eggplant, black olives and feta cheese or goat cheese. Mushroom, hard-boiled egg cream sauce, and mozzarella cheese. Cucumber, tomatoes, onions, cilantro, tossed with green vinaigrette dressing, topped with a tortilla shell filled with warm tahini, chick peas and hard boiled egg. Spinach, beets, walnuts tossed with honey balsamic vinaigrette, topped with goat cheese mini toasts. Tomatoes, cucumbers, red onions, peppers, cilantro, hard-boiled egg, tossed with cilantro dressing topped with tortilla chips and avocado. Romaine lettuce, grape tomatoes, peppers, red onions and corn tossed with our house salad dressing and pesto, topped with our special toast (garlic sauce, mozzarella cheese and feta cheese). Spinach, white cabbage, seasonal fruits, walnuts, mint, fresh ginger, sesame seeds tossed with honey balsamic vinaigrette dressing. Romaine lettuce, tossed with our caesar dressing topped with croutons and parmesan cheese. Mix greens, corn, tomatoes, cucumbers, red onions, hard-boiled egg, pickles and tuna salad. MIXED GREENS, SPINACH, ROASTED EGGPLANT, ROASTED GARLIC, MUSHROOM, ONION, ROASTED PEPPERS TOSSED WITH FESTIVAL DRESSING AND TOPPED WITH MINI TOAST. YOUR CHOICE OF TEMPURA FISH ON A BED OF ROMAINE LETTUCE, CARROT, CUCUMBER, RED ONION, SCALLION, TOMATO TOSSED WITH HOUSE DRESSING TOPPED WITH SWEET CHILI SAUCE AND SESAME SEEDS. Mix greens, romaine lettuce, white cabbage, red onion, celery, chick peas, mushrooms, hard boiled egg, avocado, tuna, and sesame seeds. Romaine lettuce, tomato, cucumbers, red onions. Tomato sauce mixed with spices. Pizza sauce, pesto, tomato, olives and mozzarella cheese. Mozzarella cheese, mushroom alfredo sauce. Pizza sauce, alfredo sauce, mozzarella cheese and spinach. Sun dried tomato sauce, pesto, spinach, black olives, and mozzarella cheese. Feta cheese, mozzarella cheese, olive oil and zaatar. Tahini, roasted eggplant, homemade crushed tomatoes and hard-boiled egg. Two eggs of your choice served with french fries (served until 12pm). Minced tuna, scallions, cilantro and fried onion flakes. Steamed soy beans, served with sea salt. Sushi rice, spicy tuna, cucumber, avocado, tortilla chips. Cucumbers, avocado, lettuce and carrots. Spicy tuna rolled in panko flakes. Salmon Tempura, Cream Cheese, Asparagus. Cooked. 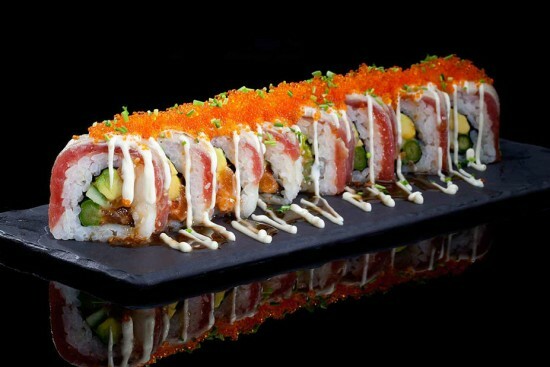 Salmon avocado roll tempura topped with baked imitation crab (volcano). Cooked. Salmon tempura and avocado topped with tempura white fish drizzled with eel sauce and spicy mayo. Salmon, spicy imitation crab, scallions rolled in crunchy onions flakes. Tuna, cream cheese, spicy imitation crab rolled in tortiiia chip flakes. Cooked. Fish tempura, cucmber, topped with poppcorn imitation shrimp. Spicy tuna, cucumber, spicy salmon and spicy imitation crab topped with jalapeno. Tuna, salmon, imitation crab, avocado, whole roll tempura with tempura fish on the side. 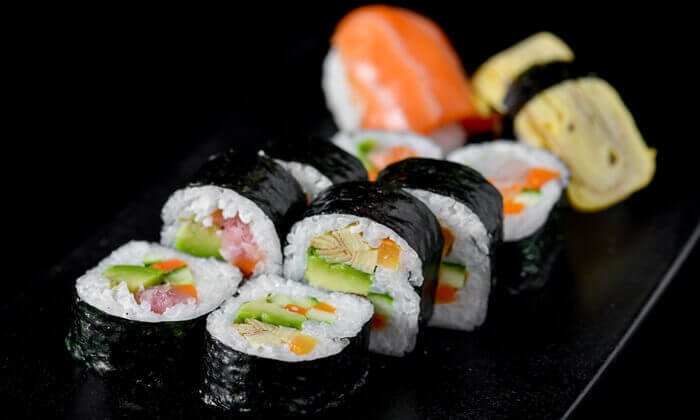 California roll topped with a rainbow of salmon, tuna and avocado. Salmon, avocado, imitation crab on top with jalapeno and spicy mayo. Spicy tuna, avocado, tempura flakes topped with tuna and spicy mayo. Imitation crab tempura, avocado, topped with salmon and spicy tuna drizzled with tempura flakes. Cooked. Imitation shrimp tempura, lettuce and avocado topped with spicy mayo and eel sauce. Imitation shrimp tempura, lettuce, topped with tuna, spicy mayo and eel sauce. Spicy tuna, avocado, wrapped in soy paper, drizzled with white sauce topped with baked imitation crab, crispy fried onion and masago. Seaweed topped with rice, imitation crab, avocado, alfredo sauce, tilapia and mozzarella cheese COOKED. Cooked. Baked imitation crab, avocado, eggplant and mozzarella in a wrap, served fried or baked, topped with spicy mayo and eel sauce. Tuna, avocado, massago, wrapped in thinly sliced cucumber, served with ponzu sauce. Tuna, salmon, avocado, masago, wrapped in thinly sliced cucumber topped spicy tuna. Chopped tuna, avocado, cucumber, carrot and green veggies tossed in orange sweet chili sauce, drizzled with almonds. Seared tuna with sesame seeds over a bed of greens with ponzu sauce. Carrot, celery, cucumber, beets, apple, ginger.